Just upriver from the brink of the Falls is the little oasis known as Dufferin Islands. A series of bridges allow you to walk through the small islands and experience a taste of Niagara Nature while remaining within walking distance of Niagara Falls (and the Skylon Tower if you’re up to it). 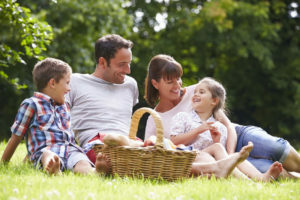 Parking is free, but it can be full in the busy season and at peak hours, so consider going a bit early and having a walk around before you enjoy your picnic. If you have ever visited the Winter Festival of Lights, you will remember Dufferin Islands for its charming animal displays. This site is partially accessible, with seasonal washroom access, and some picnic tables. Click for map. Further upriver, in the quaint town of Chippewa, you’ll find Kingsbridge Park. Situated on the water, this is a large open parkland space, perfect for large gatherings. They often charge for parking here during peak times, but the park is quite large, with a pavilion and plenty of picnic tables and space to ensure lots of room for you to play games and be active. The area is mostly accessible, with seasonal washrooms. Click for map. Located right at the brink of the Falls, Queen Victoria Park offers beautiful gardens and a large grassed area. Relax in the shade of the many trees with the roar of the mighty Niagara filling the air around you. This location is great if you want to remain in the centre of it all, close to Clifton Hill & District, with the Skylon Tower just a walk up Murray Hill. The area is partially accessible, with some picnic tables and benches, and public washroom located in the proximity. There are paid parking lots in the area, which fluctuate in price depending on time & season. Click for map. Located in the heart of St. Catherine’s Downtown core, this park is famous for its annual Grape & Wine Festivals. This is a great option if you are in the area of just want a change of scenery from the tourist area of Niagara. With bookshops and vintage clothing in proximity, couple and road-trippers will enjoy an afternoon walking the downtown streets, popping in and out of the boutiques. You’ll find plenty of grass to rest on and spread out your red and white checkered picnic blanket. Whether it’s your picnic destination or a pitstop in the midst of Downtown St. Catherine’s activities, Montebello Park is a beautiful place to take in a breath of fresh air. There is free & paid street parking in the area, and the park itself has picnic tables, a pavilion, and washrooms. Click for map. Now a picnicker’s hotspot, Queenston Heights was once a significant battleground during the War of 1812 and has been known as the birthplace of Canada. You’ll find Sir Isaac Brock’s Monument, a climbable look-out tower, as well as information on other historical sites in the area. Complete with hiking trails, baseball field, soccer field, splash pad, barbecues, and playgrounds, this park turns an average picnic into a summer adventure. Parking is free and there is lots of it. The park is mostly accessible, with washrooms facilities and occasional food service. It will take more than one visit to enjoy all this park has to offer. Click for map. Switch out that picnic blanket for a beach towel and spend a day at Charles Daley Park and Beach. With over 22.5 acres of waterfront and lush green space, there is plenty of fun to be had. Surrounded by nature, besides the beaches, there is a playground, covered picnic areas, a lookout gazebo, washrooms, a sunset boardwalk, and parking. The washrooms, gazebo, and boardwalk are all wheelchair accessible. This is a great spot to stop on a road trip or to zip to for the day. Click for map. What outing is complete without your best friend? Your best furry friend, that is. At Burgoyne Woods Park your dog can roam free in the “dog park” area of this 122-acre municipal park. Also enjoy open fields, wooded paths, picnic areas, a pavilion, as well as a seasonal swimming pool and concession stand. For those who love to cycle, this park features paved and maintained paths (fully accessible). Plus, this park is open year-round, even during the winter! Click for map. Whatever your picnic style, Niagara will always have a park for you. Picnicking truly adds a personal touch to your meal and a much-needed break from the excitement Niagara Falls and all its attractions have to offer! As always, remember to use the garbage and recycling receptacles provided on-site and to leave the parks as you found them, ready to enjoy.